The flawlessly interconnected smarthome we’ve been promised remains a mess of competing standards and random devices battling for your attention. To help streamline all that noise, LG has revealed an Amazon Echo-looking hub that includes an LCD display for keeping an eye on what your smarthome is up to. 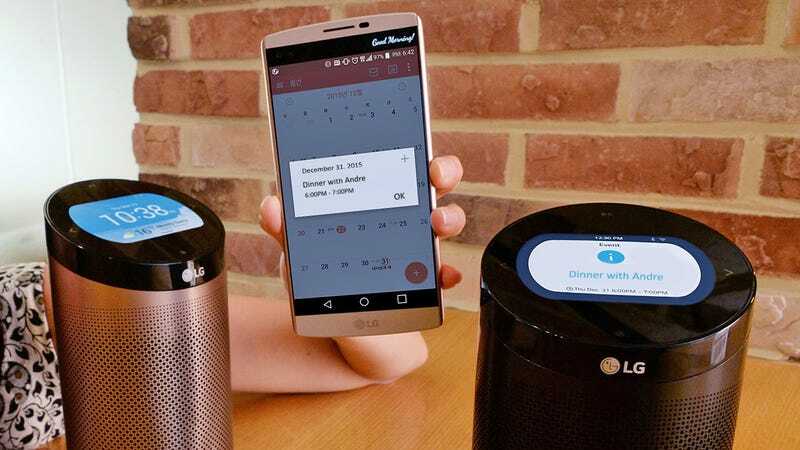 Whereas the Amazon Echo is dependent on audio cues, LG’s new SmartThinQ Hub includes the aforementioned 3.5-inch color LCD display on top allowing you to stay on top of notifications from smarthome appliances like washing machines or robovacs, as well as important calendar appointments and the like when connected to your smartphone. The hub also streams music, because slapping a Bluetooth speaker in a device is as easy as adding an LED clock these days. And with support for additional wireless protocols like wifi and Zigbee, the SmartThinQ Hub should be able to talk to non-LG devices too so you’re not locked to the company’s own smarthome ecosystem. LG hasn’t revealed pricing or availability details just yet, but the announcement does make sure to point out you’ll be able to get the SmartThinQ Hub in champagne gold or black finishes, which is all you really need to know when you’re planning to upgrade and future-proof your home.